CELTIC FANDANGO â€“ SYMBOLIC OF ‘THE ENJOYMENT OF LIFE’ is Gaelic for The God of Love and the worship of the sacredness of water. Fand is a feminine word representing The Goddess of Destiny and she understands the intertwining cosmic fibre of which she weaves the destiny of all men. Her affinity with the sacredness of water is the natural phenomenon of her connection of water and the miracle of childbirth and nature’s connection with moon rotations, the tidal movements of earth’s oceans and her. Angos is a male gender word meaning ‘Love’. Just as Tara is a very popular feminine name and more than not is given to the first-born Celtic daughter as a symbol of great beauty, or even ‘the most beautiful’. Likewise Angus is a masculine symbol for love, and is commonly given to the Celts first-born son. Religion has given a modern twist on this ancient belief with ‘Cupid’ as he fires the arrow of love from his bow, which inevitably lands in the heart of his desireâ€¦ In a time long travelled, this Celtic philosophy had Angos always kiss one of a flock of elegant white doves with a magical kiss. And have them set flight in search of his romantic desire, when his loved one saw this flock of flying angels, the magical kiss of Angos would be passed on from ‘the dove of love’. FANDANGO, The God of Love has for millenniums been represented in their fighting ‘dance’ typified by two men and a woman dancing together, each man vying for the attention and affection of the woman. Her sensual provocative response aimed at each one in turn, was always to assure her champion would be, not only the best dancer (fighter - fiona), but also the best protector and lover. 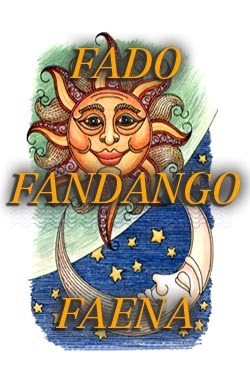 FANDANGO even more traditionally, is the concept of humans coming together to celebrate an event and to rejoice in the company of other like- minded humans. This has been symbolized throughout the millenniums by the Celts, as they have kept in tune with nature with their festivals celebrating the interchanging of the seasons. FANDANGO also meant the celebration and rejoicing any given ‘event’ and particularly after any great battle, by much revelry and mayhem with singing and dancing for extended periods of time. Always accompanied by lavish wining and dining, extravagant feasts with copious amounts of alcohol, and most importantly, always around a huge fire and near the waters edge. Be it river or lake. Like Australia’s indigenous people have done for much longer than 60,000 years, this was the ideal setting for the Celts to ‘brag about the days briga’ (i.e. briga is the Gaelic word for a ‘big brawl’ (i.e. battle) or ‘fight at the fort’. Briga has been mixed into several European languages for many centuries if not millenniums; in English (being the Gaelic equivalent language of the 21st Century), today we use the terminology ‘big brawl’. *Thus it was not surprising to any Celt why the recent phenomenal exposure of (down by theâ€¦) River dance and Lord of the Dance took the entire world by storm. As this was truly Celtic Fandango, and it definitely brought our blood to the surface of our skin. Even though America and Australia are very new countries compared to the history surrounding Europe. The United States Of America has 60.000.000 of their current 280.000.000 population are Celts, and my country Australia also has 10.000.000 direct linkage United Kingdom Celts (exactly half of our population) and most of the rest of our European, plus some of our Asian ‘Australians’ are 1st â€“ 2nd generation related, add to this the interesting mix of our 500 year old Aboriginal - Celtic association, and that is certainly a lot of Celtic blood, flowing with super-charged adrenaline.